The Queen’s Beast series celebrates the British Monarch and the centuries of fascinating heraldry that has been part of their history. 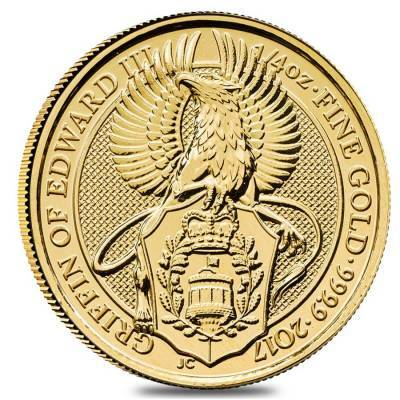 Available in 1 troy ounce and 1/4 troy ounce gold, this is the second release in a popular new 10 coin series. At the coronation of Queen Elizabeth II in 1953, the statues of the ten heraldic beasts stood guard. Sculpted for the occasion, each six-foot tall statue represented one of the strands of royal ancestry that united in the young queen. The Griffin of Edward III is an ancient mythical beast. It was considered a beneficent creature, signifying courage and strength combined with guardianship, vigilance, swiftness and keen vision. It was closely associated with Edward III who engraved it on his private seal. The shield shows the Round Tower of Windsor Castle, where Edward III was born, with the Royal Standard flying from the turret, enclosed by two branches of oak surmounted by the royal crown. The Griffin is a legendary creature with the body, tail, and back legs of a lion; the head and wings of an eagle; and an eagle's talons as its front feet. Because the lion was traditionally considered the king of the beasts and the eagle the king of birds, the griffin was thought to be an especially powerful and majestic creature. The Griffin was also thought of as a king of all creatures, they’re known for guarding treasure and priceless possessions. Today, the Queen’s Beasts can be found at the Canadian Museum of History in Quebec, while Portland stone replicas, also carved by James Woodford, watch over Kew Gardens in the United Kingdom. The portrait of Queen Elizabeth II shown on the obverse is the work of Jody Clark. This effigy features a high level of detail. If you're looking for the face value, it can also be found here. The reverse displays Jody Clark's depiction of a griffin. Like the Lion before it, the Griffin is shown with one of its front legs on top of an ornate shield. The inscriptions include the weight, purity, and date. Made from .9999 fine gold with a weight of 1/4 troy oz. 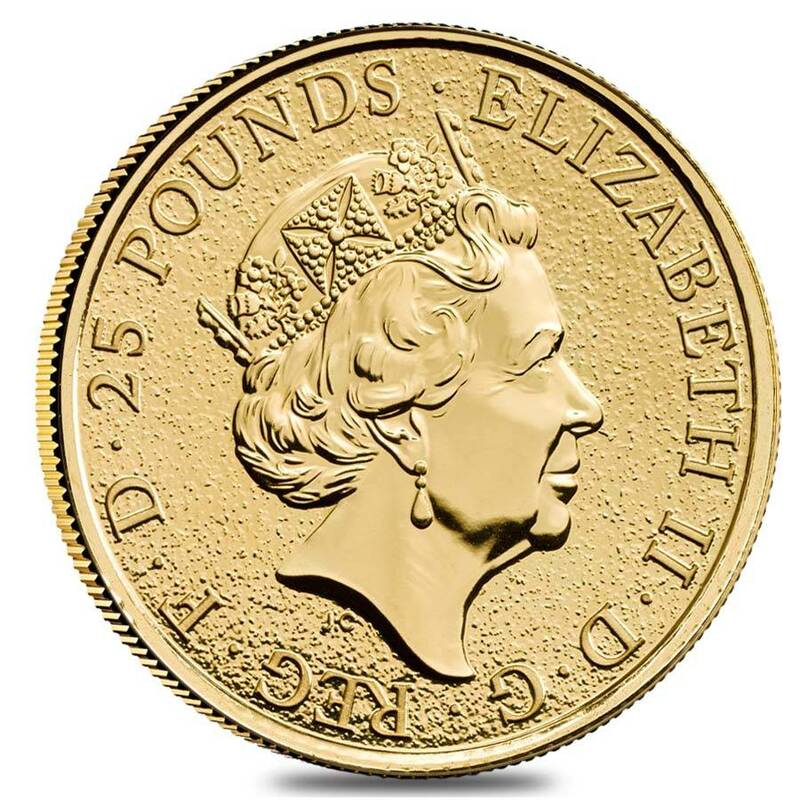 Minted by the British Royal Mint. Individual coin comes in protective packaging. Reverse: Depicts a powerful griffin clutching a shield with its claws as its wings spread to the sky. The metal weight, purity and year are inscribed around the rim. With Bullion Exchanges, you have the chance to buy gold bullion coins of the highest quality! Just like all our precious metals selection, these outstanding coins are 100% authentic and ready to be wrapped and packaged for a safe delivery to your address. For any questions, just message us, and we will be happy to assist you. 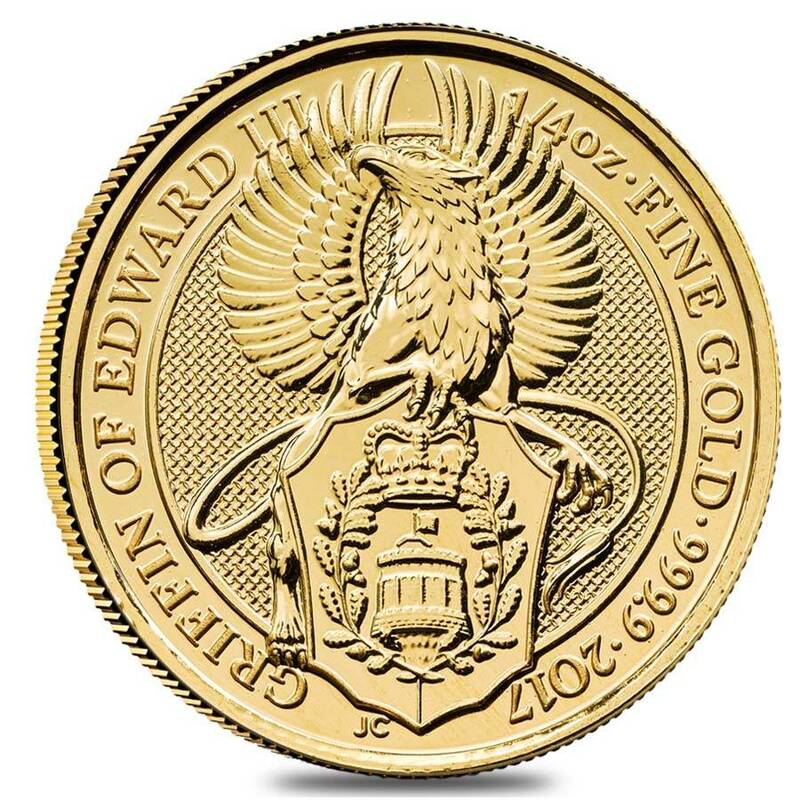 Get this stunning 2017 Great Britain 1/4 oz Gold Queen's Beast (Griffin) Coin today! With this purchase, you earn 362 Bullionaire Bucks 362 BB = $0.36. For every $1 spend, you will earn 1 Bullionaire Buck which is equivalent to $0.001 off a future purchase. 362 BB = $0.36.